This week's Grungy Monday Challenge #38 goes way back in time. 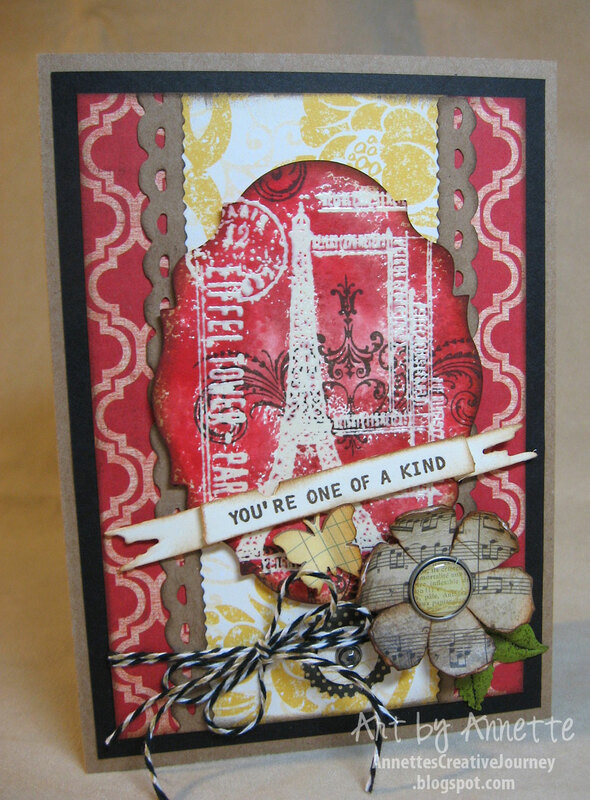 Grungy Monday Challenges are hosted by Linda Ledbetter at Studio L3. 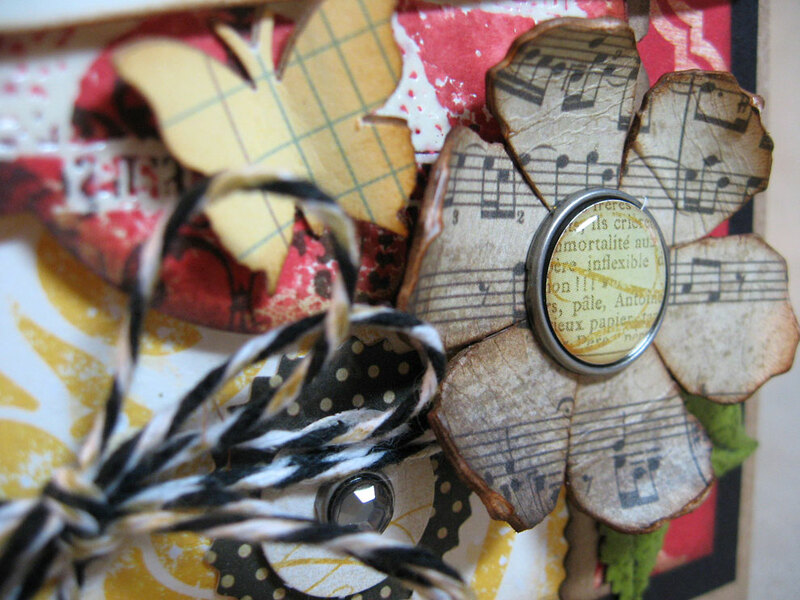 She presents us with a challenge using Tim Holtz products and/or techniques. Be sure to check out Studio L3 this week to check out all the creations from other artists there as well. It's a great way to get inspiration and learn something new at the same time. This week's challenge is from Tim's 2007 Twelve Tags of Christmas. (Told you it goes way back!) Check out Tim's blast from the past here. 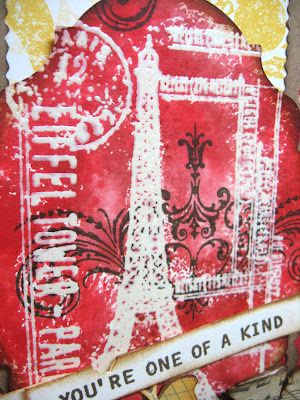 Using Snow Cap White paint dabber and embossing powder, he creates a resist effect for a cool background. I have to admit, I had some real trouble embossing on Snow Cap White. I tried a few times with unsatisfactory results, so I adjusted a bit and used pearl embossing powder instead. Much better. The main image of the Eiffel Tower stamp is embossed, then I combined Barn Door and Fired Brick on my non-stick craft mat, spritzing as Tim did and running my stamped piece through the mixture. After completely drying it, I stamped the flourish with Walnut Stain and rubbed off any extra with a damp towel. To embellish, I used a Tattered Floral die-cut with Lost & Found paper onto Grungepaper. The pretty big brad and smaller gem is from My Mind's Eye Lost & Found Two. The background papers are a mix of Teresa Collins and Little Yellow Bicycle that I had in my stash. Although you can't see it very well in this photo, I painted some Idea-ology foliage with Peeled Paint dabber, then heat set it, then finished if off with Peeled Paint Distress Stickles. Quick post today. Thanks for stopping by! Lovely card! I love all your detail! Excellent choice of stamps. I also like your flourish over the embossed area. It adds great dimention. Whoever receives this card will be thrilled. Gorgeous color combination Annette...looks wonderful with the tower and the black and white! Blog looks great too...love the changes! Beautiful card, Annette. I love the stamping and the layers of texture below. I had the same problem with the white paint and switched to black. Love your creation! This is gorgeous! The white embossing came out really well! A beautiful card Annette. The embossing looks fabulous. Just fabulous! I always struggle with this technique but am just sorting my entry out now! Wow! Your piece is awesome. Thanks for sharing it. Love the flourish behind the Eiffel tower; what a grand idea.